It’s been a while since I wrote here, but, during all this time, I haven’t cooked anything particularly interesting: too little time! But I hope to make it up with this excellent summer recipe. With the heat, there’s nothing better than a seasoning and fresh (and fast!) 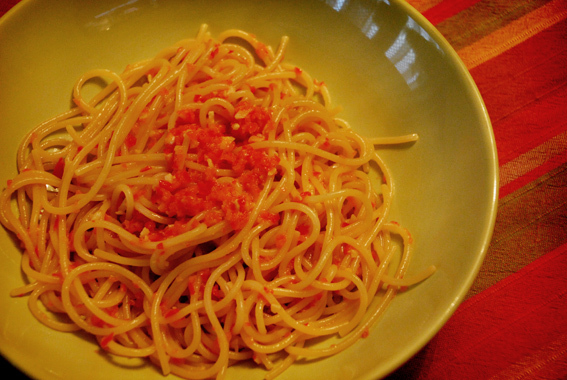 red pepper pesto sauce. In the next days I plan to cook different types of pesto, even the classic pesto Genovese, but, just to start, let’s make one with red peppers. 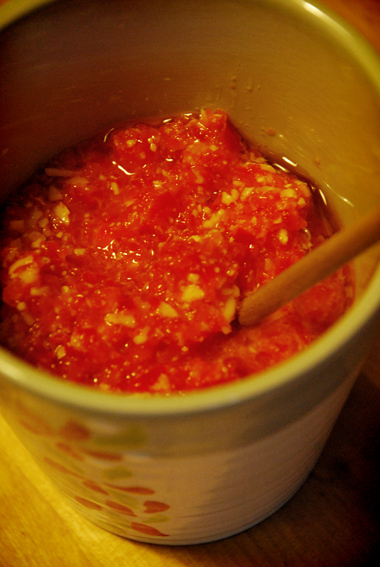 1- Put peppers, garlic, almonds and pecorino cheese in a food processor or a blender. Blend everything but not too much. The ingredients must be finely chopped and not too melted. 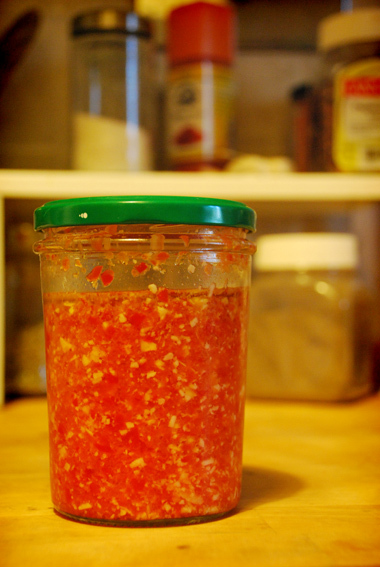 Drain several times the excess water from the mixture (peppers have the bad habit to have so much water inside!). 2- When the mixture is well chopped and well drained, remove it from the processor and put it in a bowl. Only then, add oil and salt. Mix well the compound with a spoon. 3- With the amount of ingredients listed above, I got about 3 servings for a couple. I therefore suggest to put the extra pesto in clean jars, cover the surface of the pesto with oil and place in the fridge. You can eat it within 10 days. 4- Of course you can also eat it immediately: D. It’s excellent as a sauce for pasta and it’s also delicious on sandwiches and bread. 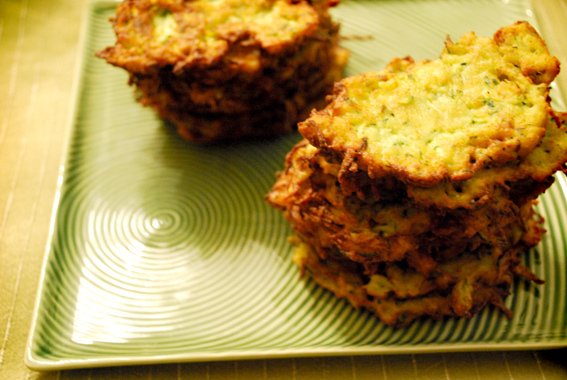 I fear that those reading this blog think that I eat only super calorie recipes. it’s just a coincidence! That said (and with a clear conscience! ), let’s come to my recipe! 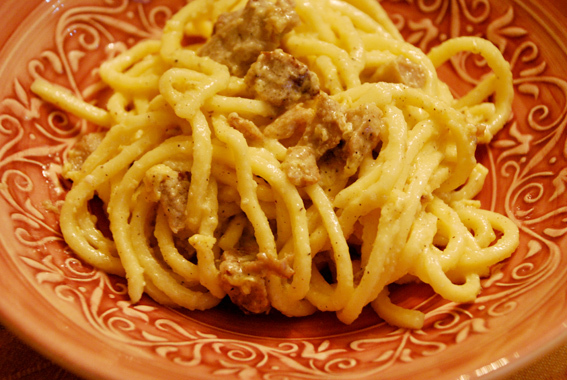 La Carbonara, for the uninitiated, is a typical dish of Italian cuisine. In particular, it’s a specialty of Rome, my hometown. 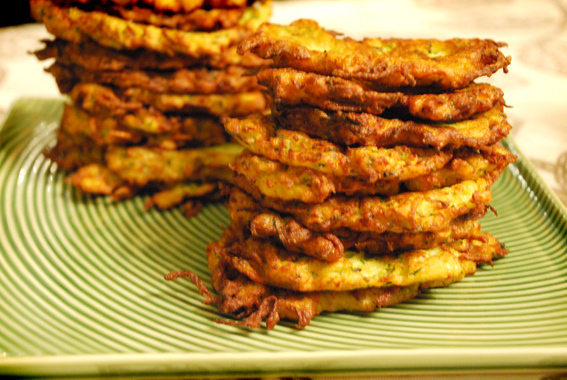 It’s a ‘poor’ traditional recipe, with simple ingredients and a strong and decisive taste. The main ingredient is bacon, but since I am a vegetarian (or pescetarian to be precise), I replaced bacon with smoked tuna. The result is truly amazing. Just try it. 200 g of long pasta such as spaghetti or bucatini o. .. I’ve already said? Long pasta! 100 g grated Pecorino Romano cheese. 1- In a large pot put a large amount of water in order to cook the pasta. 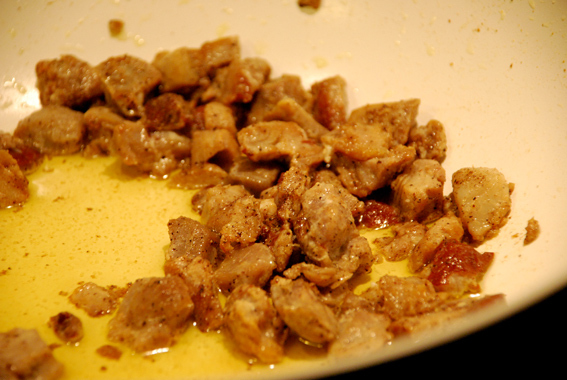 2- In the meanwhile, place the oil in a frying pan, heat it and add the diced smoked tuna. The smoked tuna is quite salty, so do not add too much salt, if not necessary, but a good grind of black pepper. Sauté a few minutes, then turn off the flame. 3- Beat the egg with a fork and add a pinch of salt and pepper. 4- When water boils, cook the pasta and respect the cooking time indicated on the the package. Remove from the heat when the pasta is still a bit hard. Keep a few tablespoons of cooking hot water in a cup, then drain the pasta in a colander. 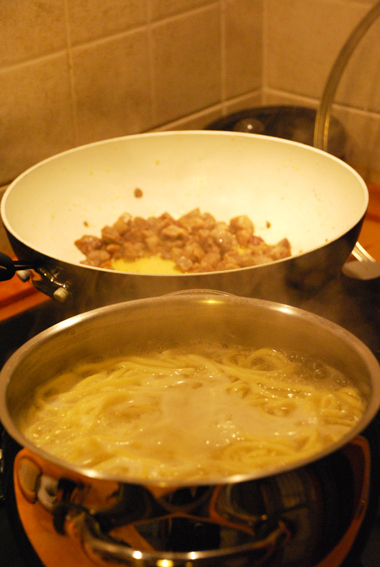 5- Turn on the heat under the saucepan of tuna, add the pasta and heat together for a few seconds. Then add the beaten egg, the cheese and a bit of hot water if the pasta seems too much dry. Mix all on the flame for up to one minute. The great thing about food blogs is that they let you experiment and try something uncommon and different from usual. In fact, the other day I was searching an original way to do something with zucchini and I came across this interesting recipe by Key Lime Pie Kitchen (thank you blogger friend for this amazing recipe!). Well, I tried it and it was delicious. I made ​​some minor modifications (because at the moment I had only potato and zucchini, so I couldn’t add any other type of vegetable), so here’s to you my pictures and my own version. abundant peanut oil for frying. 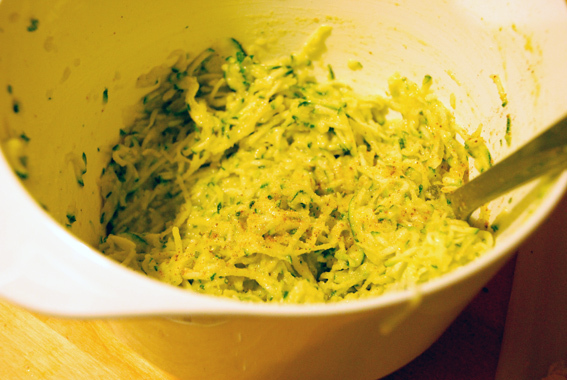 1- With food processor or by hand with a grater, grate the zucchini and potatoes, previously washed and, in the case of potatoes, peeled. 2- Place potatoes and zucchini in the colander and squeeze out as much as possible in order to remove water in excess (I have also used kitchen paper towels to absorb water). 3- Beat the eggs in a bowl. Make the batter by adding flour, bread crumbs, salt and pepper. Mix everything well and add the potatoes and zucchini and, just in case, add a bit of extra salt. Keep stirring until everything is well combined. 4- Heat the peanut oil in a frying pan at medium-high heat. Make sure it is very hot before putting the pancake mixture, by pouring a small quantity of the mix. If the oil sizzles around this piece, then you can proceed. 5- With a spoon or hands, give to the mix the shape of a pancake, one by one and, then fry them. When the edges turn golden, turn them on the other side. When they are ready, place them on a plate covered with absorbent kitchen paper and remove the oil in excess. 6- Serve hot, if you want to exaggerate with the fat, put on some cheese slices. Fast because I think that there isn’t a sauce for pasta faster than this … Furious because, come on, it’s very ‘angry’ with our health: butter, butter and more butter. But, as I usually say, if one must do bad, must do it to the fullest! But back to our happy recipe. This sauce is excellent with all types of pasta, ravioli and gnocchi. Specifically, today I’ve cooked with these special Gnocchi called ‘Spätzle‘. 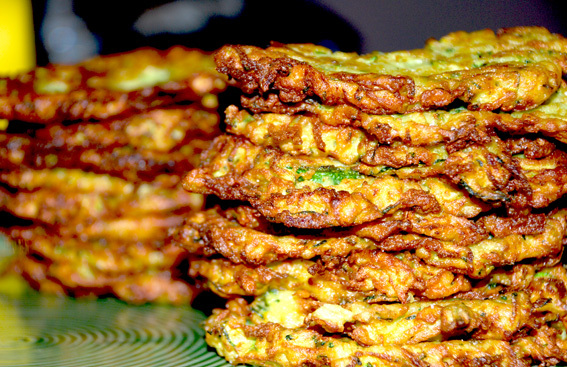 They are typically made in South Tyrol, an autonomous province of the northen Italy, Austria and Germany, and are made ​​with wheat flour, eggs and water. The ones I used today were ready-made and flavored with spinach. Delicious! 2- In the meanwhile, put in a saucepan (large enough to put then the Spätzle) butter, sage, salt and pepper. Then, with a very low heat, stir the ingredients. The heat has to be very low because the butter must not fry, but just melt. So turn off the heat when the butter is melted. 3- When the water boils, add salt and then add the Spätzle. As for the potato gnocchi (check out my previous post), remove them from the water with a perforated spoon when they come to the surface and pour them into the saucepan with the butter. 4- Add the Parmesan cheese, and, turning on once again the stove under the saucepan – always low heat – stir well until all the cheese melts. 5- Serve hot and well … enjoy it! Before I met my husband, frankly, I did not go crazy for potato gnocchi. I always preferred by far rice, pasta or ravioli. Everything but gnocchi! Then I realized why I did not like them too much: because my mother always cooked them with tomato sauce and Parmesan cheese. It was not bad but I think that such a flavor is ‘boring’, at least for my taste. Then, tasting here and there, and thanks to my husband, I realized that the Gnocchi are an original as well as excellent ingredient for many delicious recipes: with fish, vegetables, mushrooms, truffles, “pesto”, and so on… And, of course, even in this fresh recipe that I am proposing in this post. One day I will publish the recipe of homemade potato gnocchi, which I assure you, is such simple as long to do. 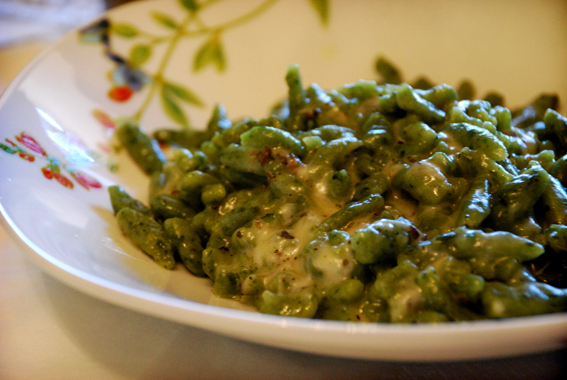 So for this recipe I used the gnocchi Rana (a famous brand of Italian pasta and ravioli). 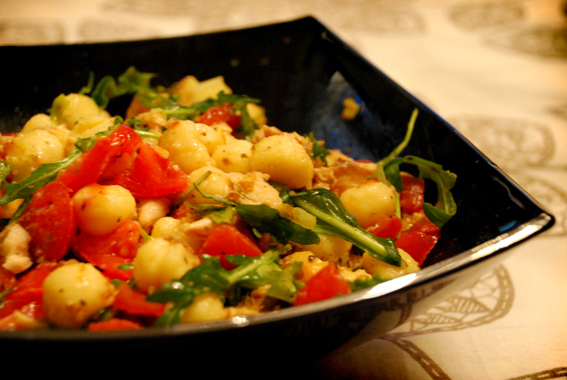 You can find some historical information about Gnocchi here (Wikipedia), of course! 1 – In a non-stick pan, pour 2 tbsp olive oil, sauté the leeks, and when they are golden, add the mackerel. Brown the mackerel for few minutes without burning. Turn off the heat and allow it to cool. 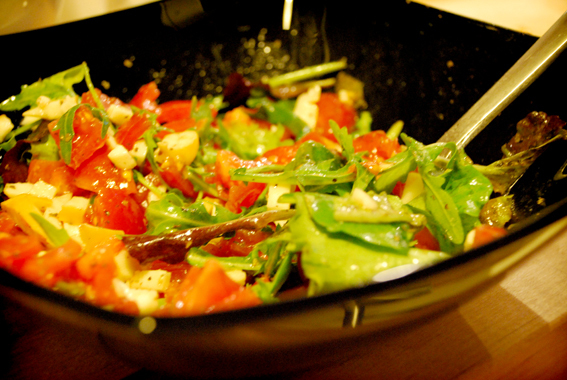 2 – In a large bowl, place the diced tomatoes, the salad, the smoked cheese diced, 2 tbsp of olive oil, marjoram, basil, salt and pepper. Mix everything well. 3 – Boil water in a pot. Add salt and add gnocchi. Gnocchi are ready when they come to the surface, usually in a minute. With a perforated spoon, remove gnocchi and before adding them to the bowl with the dressing, mix them into the pan with leeks and mackerel, just to get them a bit flavored. 4 – You can serve immediately. Excellent also as a cold pasta salad. The proceeding behind this side dish could be defined somehow as the foundation of Italian cuisine. 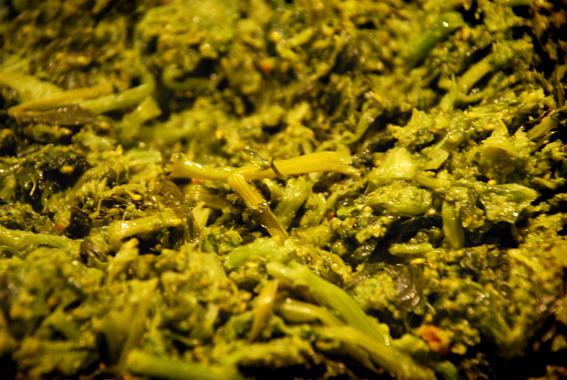 In fact, most of the vegetables can be cooked in this way, as well as many pasta sauces. 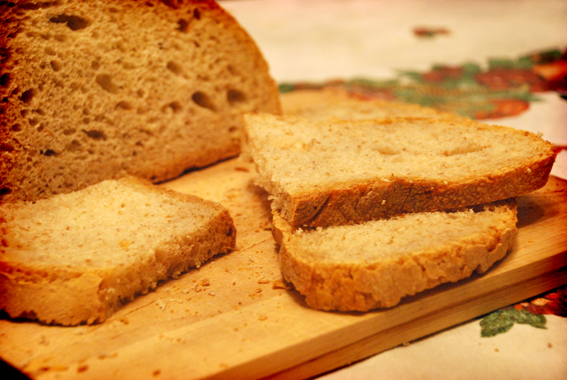 So you can serve as an accompaniment to a main course or it can be even eaten alone with some fresh bread. 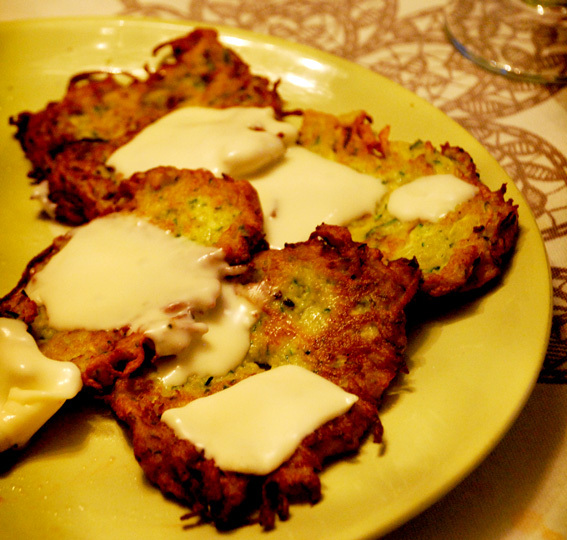 So I decided to post this recipe especially for the benefit of non-Italians who read my little blog! 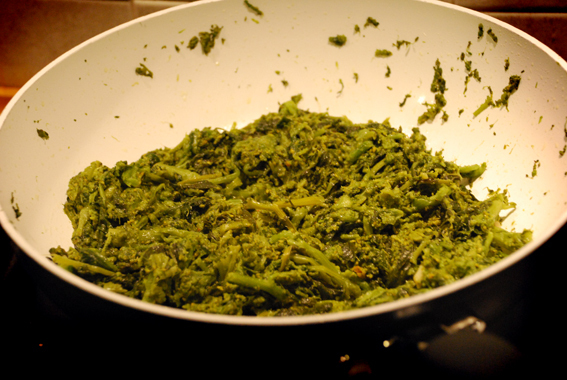 1- Wash broccoli, remove any loose or damaged part. Boil them in salted water for 7 minutes from the recovery of the boiling or more if you are using cabbages. If you use a pressure cooker, cook for 4 minutes maximum after the hiss (or follow the specific instructions of your pressure cooker!). 2- Sauté in a a large nonstick pan the cloves of garlic and chilli. When the garlic turns golden, add the previously drained vegetables. Add salt to taste. 3- Sauté on high heat for three minutes, then add a glass of water and, covering with the lid, cook until water is absorbed and the vegetables are dried up in the pan. About 8 minutes. Actually you have to see by eye when the broccoli are ready: it depends on how much you like them soft. 4- Serve hot as a side dish. Very delicious with fresh Italian bread. 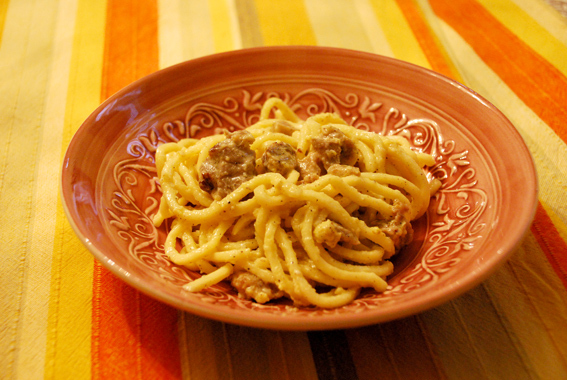 Tasty option: when sauté, you can use a bit of anchovy paste to give a stronger and savory flavor. In this case, pay attention that the anchovy paste tends to burn easily. 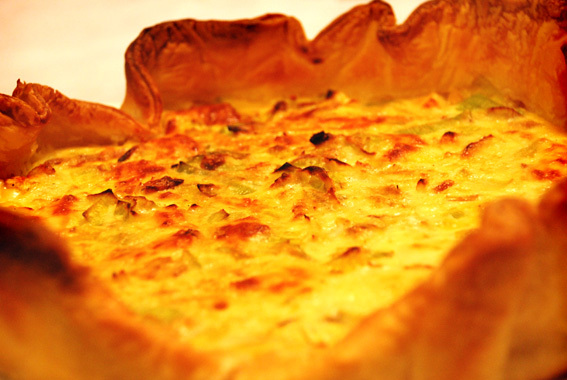 Delicious leek and cheese pie: How to resist? Enough, less greetings and more recipe! 1 pinch with grated nutmeg. 1- Preheat the oven to 190 ° / 200 ° C (390 ° F). 2- Place the pastry on a round baking tray covered with baking paper. Prick with a fork the pastry so to avoid creating air bubbles during the cooking. 3- Sauté the leeks, previously cut in thin slices, in the oil, until they become golden brown. Add some salt and pepper to taste. 4- Meanwhile, whisk the eggs, adding milk, salt, pepper, nutmeg and Parmesan cheese. 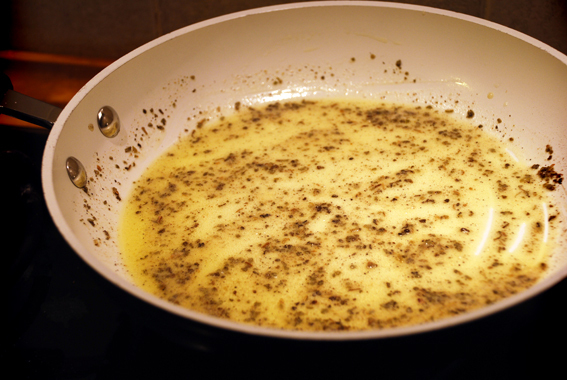 5- Finally, add the leeks and cheese Leerdamer (or whatever) to the mixture of eggs. Mix lightly and pour it slowly into the pan on the pastry. 7- Bake for about 15-20 minutes but keep an eye on the oven. The edges of the pastry should be golden and crisp! And here’s your pie! Enjoy it!